Are you looking for the best small business payroll program that won’t break the bank? 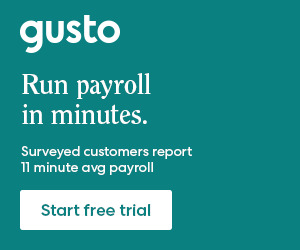 Here’s why you need to try Gusto Payroll services. Finding the best small business payroll service isn’t always easy or cheap. It takes time to research the best programs, find the features you’ll actually use, and then stay tax compliant. But that’s what I do for YOU here at Careful Cents! I take the time to test out different accounting programs, payroll software, and productivity tools so you can stress less and earn more money. I want you to be able to make the best decision for your business, without overspending. Gusto is an online small business payroll program that’s easy to use, budget-friendly, and offers a wide variety of services. In the past, small business owners would have to hire an accounting firm or payroll service to process employee payroll and company benefits. But thanks to Gusto, you can easily set up payroll, tax reporting, and other benefits for your company or S Corp — even if you’re the only employee. Processing payroll with paid time off (PTO), bonuses, and reimbursements is easy and affordable with Gusto. One of the best features of Gusto that’s very attractive to small business owners is the fact that Gusto calculates and pays all of your payroll taxes automatically. As someone who used to process payroll taxes for companies in Texas, I know how time consuming and confusing this can be! Here’s a quick overview of how to get started with Gusto Payroll. Throughout my testing and using of Gusto, I really like how focused they are on helping small business owners be tax compliant while simplifying the payroll process. This can be one of the most complicated parts of running a business, and Gusto takes away this headache. Getting started with Gusto is easy and for free when you sign up through their one-month trial period. No credit card required. You can also sign up to access the free demo account so you can test out the software before committing to paying every month. Click here to try Gusto free for one month! When setting up Gusto you’ll need to confirm your business and personal information, like your business name, address, and the preliminary information for each employee or contractor. If you need to call customer service you’ll have to verify your personal identity with your Social Security number (which is separate from your EIN), date of birth, and phone number. Make sure you fill in this information under the Account Preferences section. One of the best reasons to use Gusto is to process payroll filings and taxes on your behalf — yep, you don’t even have to think about it! You’ll have to put your EIN, type of business, federal deposit schedule, and the form you use to file income taxes. You’ll then setup your payroll tax filing schedule, test the link to your bank account, and any other tax-related details. They have a free compliant checklist inside the dashboard. Under the Documents section, Gusto Payroll has a wide variety of forms and templates for employees and contractors. You can choose from one of their many templates, or upload your own documents. They focus on being mobile-friendly so you can have new hires can fill out and sign these online. Some of the main tax forms that Gusto offers include, Form W-4 for tax withholding, Direct deposit authorization, and Form 8655 which authorizes the company to pay and file federal taxes on the contractor or employee’s behalf. Gusto recently rolled out their complete HR Service program which allows for much more extensive company benefits. This includes benefits such as health insurance, 401(k) retirement plans, worker’s comp insurance, 529 college savings plans, and spending accounts like HSA and FSA. To complete the process of setting up your Gusto small business payroll account, you can add a team member to your account. You can share reports and financial documents with your accountant, bookkeeper, assistant, or other team member by inviting them to collaborate. This can be found under the Settings and Collaboration sections. The great thing about Gusto is that you can try out their software free for one month, and if you like the service you can expect to pay the following pricing plans. Base price is $39 per month, then you’ll be expected to pay between $6-12 per person/employee. This means the base price starts at $45 per month ($39 + $6 for one employee). But there are no hidden fees, no setup fees, or annual contracts. What you see is what you get with Gusto! You can make Gusto Payroll as streamlined or as complete as possible. You can use it for just 1 employee, which is great if you’re the only employee of the S Corp. However, you can use it for a large business of up to 150 employees or more. Basically, there isn’t much that Gusto can’t do when it comes to payroll and tax reporting services for your employees or contractors. In addition to an extensive list of features and services that Gusto Payroll offers, it also integrates seamlessly with other accounting and bookkeeping software. Should you use Gusto or Intuit QuickBooks Online Payroll? If you’re simply comparing pricing plans, then Gusto is going to be the cheapest option. Gusto’s base services will cost $45 per month ($39 + $6 for every employee), while the QuickBooks Online Payroll Full Service costs $81 per month for the first 6 months ($79 + $2 for every employee). While Intuit QuickBooks Payroll does offer cheaper options, they require more work on the behalf of the business owner. The Full Service option is more comparable to Gusto’s offerings. Gusto offers many of the same features as Intuit QuickBooks Online Payroll, so really it comes down to your preference and what kind of accounting process you have with your business. The benefit of using QuickBooks Online Payroll over Gusto is if you use other QuickBooks products (like TurboTax Self Employed or QuickBooks Self Employed). You’ll save a lot more money in the long run by bundling your services with Intuit. To read more about bundling your services with QuickBooks Self Employed, click here to read our in-depth review. Can Gusto work if you don’t have employees? As a business owner you can use Gusto to help streamline your processes and save money by avoiding expensive hires. And you can use Gusto even when you don’t have employees. Gusto is great for getting started with just a few contractors, or paying yourself a salary as an S Corp or LLC. You can process payments every month, or every week, and Gusto will issue 1099s for you at the end of the year. Click here to read more about how much to pay yourself as a small business owner. After filing to become an LLC in 2017, and as a small business owner myself, it’s my personal opinion that Gusto is a very budget-friendly option for getting started with payroll. You can test it out free for one month to see if you like it (no credit card required). Plus, the service can grow with you as your business expands, and you add more contractors or employees.